Showing 1 - 14 of 14 articles tagged "Scott M. Gimple"
"This was much more physical," Nicotero says of the scene between Andrew Lincoln and Jeffrey Dean Morgan. 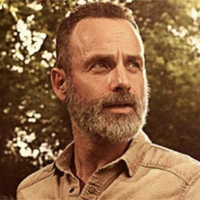 Creator Robert Kirkman called last night's episode a "huge turning point" for Rick Grimes. The Walking Dead franchise boss on spinoff plans: "We're going to be doing traditional stuff, non-traditional stuff, stuff people don't expect"
Lauren Cohan joins ABC pilot Whiskey Cavalier: Is she done with The Walking Dead? Over the weekend, The Walking Dead showrunner Scott M.
Will AMC expand The Walking Dead universe? The promotion of Scott M.